AS Pest Control provide an efficient, affordable and professional fly control service in Mansfield. Available 24/7 we offer a quick and reliable service to conveniently remove the fly problem. There are many types of flies, identifying the species will affect the method used to treat the problem. The breeding site (if any) of flies is important. If there are blowflies (blue & green bottles) it will be a body of some kind. In the case of filter or sewage flies it could be any damp organic sludge. 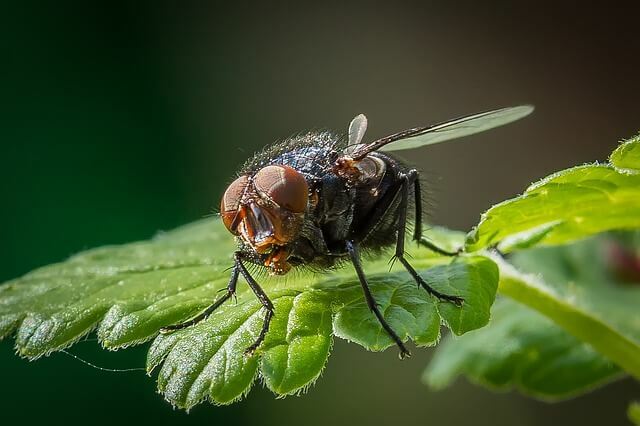 House flies and lesser house flies are common with their larvae (maggots) feeding on rotting organic material or animal faeces. Adults can travel several miles to feed, mate and lay eggs. Flies are disease carriers as well as a nuisance, any infestation should be treated professionally. Contact AS Pest Control and we can provide a free onsite fly control Mansfield quotation. Houseflies are potential vectors of a wide range of diseases such as dysentery, gastroenteritis and tuberculosis. They can also transmit intestinal worms. They move from filth to food indiscriminately and may therefore have pathogens from dirty to clean areas. Good hygiene is essential to limit breeding sites and food sources. Refuse should be stored in well sealed containers. AS Pest Control provide Fly Control in Mansfield starting from only £80. AS Pest Control will always assess the fly problem, identify the species and use the most appropriate treatment. Treatment can depend on the circumstances. A variety of treatments are available including insecticide, fly screening, fly traps and UV light stalls. A combination approach may be required. A common domestic treatment is to apply a residual insecticide to the walls and ceilings. This kills flies as they land on the treated surface and lasts for 1 - 3 months inside. After treatment has been applied do not let domestic animals walk on the treated surfaces until dry. If bare skin comes into contact with the treatment whilst wet ensure this is washed off. Treated surfaces inside that are clean prior to application and not washed down after treatment will retain active insecticide for up to 3 months. AS Pest Control provide a local, affordable fly control solutions for residential and commercial customers in Mansfield, Nottingham, Derby, Chesterfield, Worksop and surrounding areas.